Anthony Hemingway’s Red Tails gives movie goers a pilot’s eye view of World War 2, but fails to deliver any emotional victory. Based on the story of the Tuskegee Airmen, the first African-American squadron of military pilots, Red Tails is a film that does its damnedest to be as epic as humanly possible. Beginning with a dogfight in which caucasian American pilots battle nazis in the skies over Germany, the effects team at Lucas Arts wastes not a single frame when it comes to displaying their full CGI capabilities. This obviously works at pulling in any red-blooded patriot, and goes a long way towards amping viewers up for the 120 minutes that follow, but then viewers find themselves on the ground and things quickly turn from engrossing to dull. 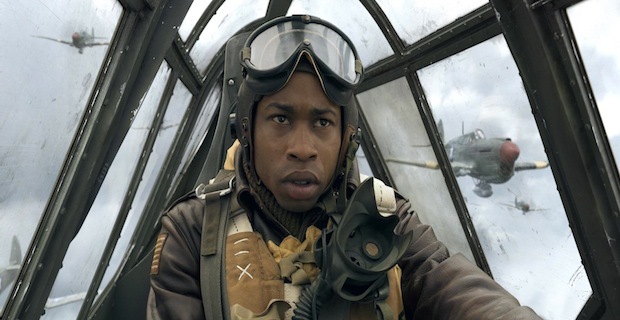 It is not Hemingway’s fault, nor that of screenplay writers John Ridley and Aaron McGruder, Red Tails simply bites FAR more than it is able to chew and properly regurgitate in a way that is ever truly rewarding to the audience. While the dogfights are exciting and nothing short of a true CGI feat, the focus on action and need to cover what feels like months of story causes the entire film to only skim the surface of human emotion. We rarely, if ever learn of the soldiers’ struggle with bigotry in or out of the system up to this point, which leads one to wonder just what the studio was hoping to accomplish with the film. Are you paying tribute or cashing in on a “cool” history story? Either is fine, we expect nothing more at this point, just be honest in your approach. For all of its faults and shallowness, Red Tails does deliver some truly great action sequences and cinematography. Those looking for a true portrayal of the accomplishments of the Tuskegee Airmen will likely be left disappointed, but everyone else will at least be entertained. While not the finest of war films, those seeking the warm embrace of a cinema could do much worse this time of year.